Can Eating Carrots Help You Lose Weight? The diet stereotype of noshing on carrot and celery sticks all day is a cliche for a good reason -- carrots are a great diet food. They're naturally low in calories and full of nutrients that can help your weight loss efforts. Don't feel doomed to snack on plain raw carrots day after day, though, because there are lots of tasty but diet-friendly ways to include them in your diet. Carrots make a great diet food because they're low in calories. A cup of raw carrot sticks has only 50 calories, which is just 3 percent of the daily calorie "budget" in a 1,500-calorie diet. If you're trying to lose weight faster and eating only 1,200 calories a day, a cup of carrot sticks will use up only 4 percent of your calorie allowance. Boiled carrots are slightly higher, with 54 calories per cup whereas canned carrots have only 37 calories per cup. Whichever type you choose, you can easily make carrots part of your calorie-conscious diet. Carrots are a nutritional heavyweight when it comes to vitamin A. No matter which type of carrots you choose, you'll get all the vitamin A you need for the day. A cup of raw carrots, for example, offers 408 percent of the daily value per cup, while a cup of boiled carrots has 532 percent of the daily value. Your body converts vitamin A from food into chemicals called retinoids, which interact with your cells and tissues. Some forms of vitamin A communicate with your fat cells, and influence new fat cell growth, fat storage and obesity, according to a review published in Archives of Biochemistry and Biophysics in 2015. The review notes that vitamin A might play a role in reducing abdominal obesity -- the type of obesity that poses a serious health risk. Getting more vitamin A might also benefit your health if you have a few pounds to lose. People with obesity tend to have low levels of vitamin A in their tissues, according to a study published in Scientific Reports in 2015. Since your cells need vitamin A to function properly, not having enough might prevent your cells and tissues from working at an optimal level. Carrots also have a few other nutritional benefits that may help you lose weight. They offer a small-but-significant amount of fiber per serving -- 14 percent of the daily value in a cup of raw carrots, and 18 percent in a cup of boiled carrots. Eating fiber is good for weight loss -- it means you need to chew your food more, so you're likely to eat slower and more mindfully, and it also helps you feel full, according to Colorado State University. Carrots also help boost your intake of vitamin C. Getting enough vitamin C in your diet is key for burning fat during exercise, according to a study published in a 2006 issue of Nutrition & Metabolism. The study found that young adults with lower-than-optimal vitamin C levels burned 25 percent less fat during cardiovascular exercise than those with normal levels, and upping their vitamin C intake back to normal levels helped increase their fat burn during exercise. A cup of raw carrots has 12 percent of the daily value for vitamin C, while a cup of boiled carrots offers 10 percent. Use carrots to boost your vitamin C intake, so you can be sure to get the greatest amount of fat loss from your workouts. 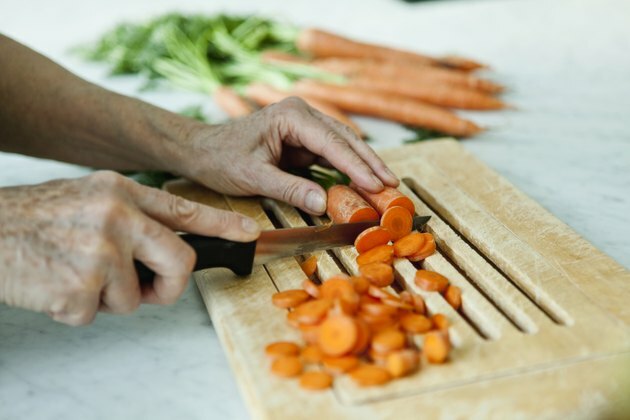 For the healthiest options, eat raw carrots or cook your own carrots from scratch, using a healthy cooking method, like boiling or grilling. While canned carrots are convenient, they can also be high in sodium -- a cup of canned carrots has 15 percent of the daily sodium intake limit, compared to 4 percent for raw or boiled carrots. Although sodium doesn't disrupt fat loss, it can make you retain water -- meaning that the scale won't budge -- or it might seem that you've gained weight from the excess fluid. You can drizzle small, whole carrots with olive oil and top them with fresh rosemary. Then, wrap the carrots in aluminum foil and bake until the carrots are tender, for a flavorful side that's anything but boring. Add shredded carrots and cinnamon to your oatmeal as the oatmeal cooks, then top this with chopped walnuts for something that's like "carrot cake" oats. Or, you can blend shredded carrots, low-fat coconut milk, a scoop of vanilla protein powder and a dash cinnamon and nutmeg for a diet-friendly, carrot-cake flavored smoothie. Does Boiling Carrots Destroy the Nutrients?